We are now going to look at a very important theorem in Calculus known as The Mean Value Theorem. a) $f$ is a continuous function on the closed interval $[a, b]$. b) $f$ is differentiable on the open interval $(a, b)$. 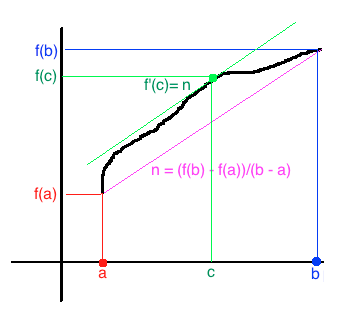 Then there must be a value $c \in (a, b)$ where $f'(c)(b - a) = f(b) - f(a)$, that is, there must be a point $(c, f(c))$ whose tangent line has the same slope as the line connecting $(a, f(a))$ and $(b, f(b))$. Lemma 1: If $f'(x) = 0$ for all $x$ in an interval $[a, b]$, then $f$ had to be a constant on $[a, b]$. Lemma 2: If $f'(x) > 0$ for all $x$ in an interval $[a, b]$, then $f$ is increasing on $(a, b)$. Lemma 3: If $f'(x) < 0$ for all $x$ in an interval $[a, b]$, then $f$ is decreasing on $(a, b)$.